WellSpan Health is a leading integrated healthcare system in south central Pennsylvania. With two primary teaching hospitals - WellSpan Good Samaritan Hospital and WellSpan York Hospital - and over 19,000 employees, WellSpan provides a robust learning environment for medical and dental students, residents and fellows. WellSpan features over 170 patient care locations, eight respected hospitals, a Level One Regional Resource Trauma Center, a Comprehensive Stroke Center with endovascular neurosurgery capabilities, several Primary Stroke Center hospitals, and regional referral centers for heart and vascular, oncology, orthopedic, neuroscience, women's and children's services and behavioral health. Learning opportunities abound throughout our teaching facilities and medical practices. Well-managed and financially strong, WellSpan sponsors family medicine residency training at WellSpan Good Samaritan Hospital and fourteen residency and fellowship programs based at WellSpan York Hospital. Medical student rotations are available at both hospital sites, as well as WellSpan Chambersburg Hospital and WellSpan Waynesboro Hospital. WellSpan hospitals are affiliated with several regonal medical schools, including affiliations with Drexel University College of Medicine (WellSpan York Hospital - York Regional Medical Campus; WellSpan Chambersburg/Waynesboro Hospitals); Penn State College of Medicine (WellSpan Chambersburg/Waynesboro Hospitals, WellSpan Good Samaritan Hospital, and WellSpan York Hospital); Sidney Kimmel Medical College of Thomas Jefferson University; West Virginia College of Osteopathic Medicine (WVSOM/WellSpan Chambersburg/Waynesboro Hospitals); Philadelphia College of Osteopathic Medicine (PCOM/WellSpan Good Samaritan Hospital); and Lake Erie College of Osteopathic Medicine (LECOM/WellSpan York Hospital). In keeping with WellSpan Health's focus on Patient Safety and ongoing quality improvement, all WellSpan residents complete the Institute for Healthcare Improvement's (IHI) Open School Basic Certificate in Quality and Safety. We encourage you to look over the medical education programs throughout this site. We focus on providing training programs aligned with our clinical and population health missions. Our commitment to education is significant, and we look forward to ongoing leadership in medical education at all levels of training. We are committed to excellence in medical education. This excellence is achieved via the diversity of our students, residents, fellows, faculty, and staff. The broad range of experiences of our medical education personnel, and an inclusive learning environment, alows us to provide optimal care for our patients and our community. We actively promote an equitable, safe, and diverse educational environment, and we look forward to a continuing environment of collaborative work and learning. WellSpan Health is committed to providing the training and resources to handle the stresses of training in a complex, fast-moving healthcare system. Our residents and fellows help shape our system policies and procedures via participation on committees at the hospital, medical group, and system level. We provide solid benefits including meal cards, healthcare and dental insurance, and the full range of services available through the WellSpan Employee Assistance Program (EAP). In fact, several of our programs have implemented regular contact sessions with our EAP team, coordinated well-being journal clubs with EAP leadership, and provide flexible support to meet the needs of life outside of medical care and training. A 172-bed community-based acute care hospital in Lebanon, Pennsylvania, WellSpan Good Samaritan Hospital supports a family medicine residency program with six residents per year in a PGY-1,2,3 format. WellSpan Good Samaritan Hospital features an award-winning cardiac and vascular center, a certified Primary Stroke Center, a wound care and hyperbaric medicine center, and the Sechler Family Cancer Center, Lebanon's first and only integrated cancer center. Medical students and residents experience excellent hands-on patient care and teaching provided in an integrated community-focused system. WellSpan York Hospital Obstetrics and Gynecology residents and Penn State M.S Hershey Medical Center Surgery residents also rotate at WellSpan Good Samaritan Hospital. WellSpan Chambersburg Hospital and WellSpan Waynesboro Hospital serve Franklin County and adjoining communities. The hospitals have award-winning stroke centers, cardiac centers, and a Level 2 Neonatal Intensive Care Unit (NICU) at Chambersburg Hospital. The west campus of WellSpan in the Franklin County area has multiple walk-in care centers, urgent care centers, patient-centered medical homes (PCMH), physical therapy units, and various advanced clinical specialists. Physicians and providers have experience in educating residents, medical students, nurse practitioner students and physician assistant students in a fast-paced community setting. Clinical affiliations are in place with Penn State College of Medicine, Drexel Univerisity College of Medicine, West Virginia College of Osteopathic Medicine and multiple other colleges. Longitudinal Integrated Clerkship (LIC) students from Penn State College of Medicine complete their entire thrid-year clinical experiences here as well. And, WellSpan York Hospital Emergency Medicine residents have rotated in the Emergency Department at WellSpan Chambersburg Hospital for many years. The Office of Continuing Medical Education (CME) helps all of our physicians and providers keep up to date with the latest science and medical treatments. The region's leader in advanced specialty care, WellSpan York Hospital is a 580-bed community teaching hospital which serves a population of over 520,000 in south-central Pennsylvania. As a Level One Regional Resource Trauma Center, a certified Comprehensive Stroke Center with endovascular neurosurgery capabilities, a certified Chest Pain Center, a level III Neonatal Intensive Care Unit (NICU), a high-risk pregnancy referral center, and many other advanced clinical specialties, the hospital is an outstanding training site for medical and dental students, residents, and fellows. The Hospital is a Regional Medical Campus of Drexel University College of Medicine, and is one of only 400 members of the prestigious Council of Teaching Hospitals (COTH), with a long history of excellence in medical education. Over 150 residents and fellows are based at WellSpan York Hospital for their training, and over 400 medical students complete clinical rotations here yearly. The fully-staffed, high-tech WellSpan Medical Simulation Center supports our training efforts and has allowed us to beome a leader in real-life medical and surgical simulations, and in interprofessional education (IPE). With a wide range of teaching activities, programs, and sites, WelSpan Health is well-positioned to meet the current and future needs of our patients and our communities. 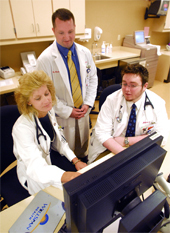 WellSpan sponsors a variety of key educational support systems to provide access to medical literature and knowledge, provide real-life training and simulation, and ensure that today's physicians and healthcare providers maintain current clinical and procedural knowledge to provide safe, timely, effective, efficient, and patient-centered care. Our Medical Library and Learning Center services provide key information support to allow ongoing high-quality care. Our state-of-the-art Medical Simulation Center boasts use by a large number of physicians, nurses, residents/fellows, students, and other learners. The WellSpan Emig Research Center supports research and performance improvement projects of all sizes and complexity. Fully-staffed and ready to guide investigators-in-training, the WellSpan Emig Research Center staff help train and guide our Resident, Fellow, and Faculty researchers. In addition, the Emig Research Center hosts the annual WellSpan Discovery Day: Resident and Fellow Research and Scholarly Activity sessions, which highlight the best projects based within our medical educaiton programs. And, the WellSpan Health Office of Continuing Medical Education (CME) helps all of our physicians and providers keep up to date with the latest science and medical treatments. WellSpan's CME program recently achieved Accreditation Council on Continuing Medical Education (ACCME) Accreditation with Commendation status, the highest possible level of accreditation.